Gurlll, you gonna get your stockings dirty gettin all down on the floor like that! I’m missing “Drive” right now to post this, because I’ve been dying to get to this page for ages. I hope you guys like it! I’d also like to plug another webcomic this week! This time it’s Hemlock, by Josceline Fenton. It is SOOOO GOOD, so you should check it out! 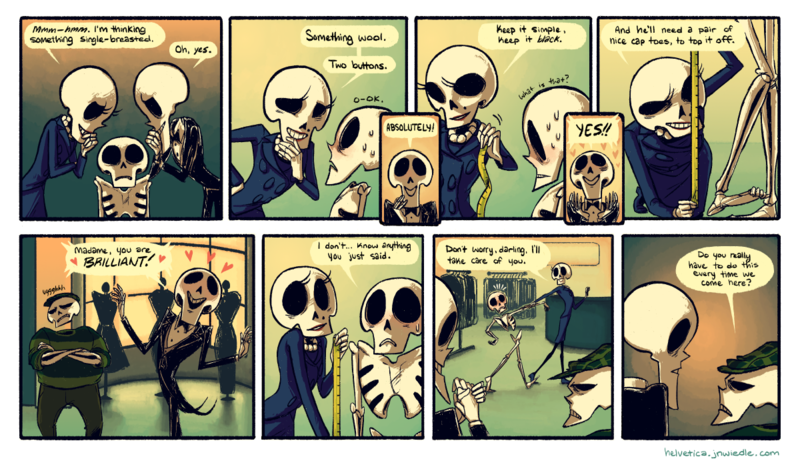 i vote that you draw the most adorable skeletons on the entire internet ok. i love them more and more every panel. Every Friday I’m always looking forward to your pages. Even when your character design is simple (because they are all bones and all) you breathe so much life into them. Their shape, movement, clothes, and their different smiles and frowns gives each character a unique individualism. Even though they are made of bones you really can tell who’s who. Love your work so much! Goodness gracious, I love this comic. The art is so bold and bright and I love skeletons and cartoons. Keep it up! I’m excited to see what will happen next! “What is that?” he says. Never seen a measuring tape in your life, Helvetica? No negativity in this blog, but please don’t mention… that. i meant comic, not blog lol. Why wouldn’t they mention that? like uh?